For multiple decades (and countless more to come), the saying "Built Ford Tough" has proudly represented the foundational principles that go into America’s most reputable lineup of dependable, durable trucks. 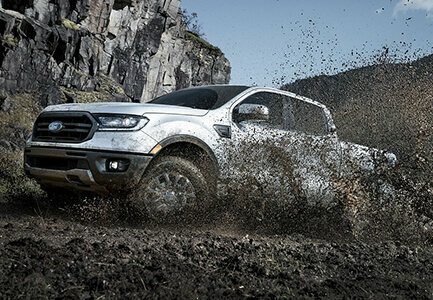 This time-honored approach Ford follows to build legendary pickups again and again holds true for the latest Ranger. Potential buyers who are interested in purchasing or leasing a vehicle that can equally handle Dover streets and a wide variety of bumpy terrain should put Ranger at the top of their list. 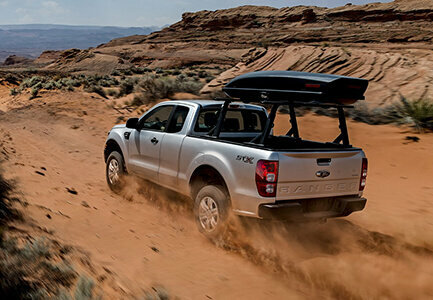 Constructed with steel bumpers and two hooks attached to a high-strength, completely boxed steel frame for incredible sturdiness at its core, Ford tested the resilience and strength of Ranger in extremely demanding conditions and environments to make sure you could tackle any possible scenarios in your future travels. After experiencing strenuous trials that required robot drivers, towing hefty loads up steep inclines in sizzling weather, and withstanding jarring incidents, there is no doubt the redesigned Ranger is completely primed for your off-road expeditions. If you are pumped to learn about sitting in the driver’s seat of this pickup boasting outstanding multi-terrain adaptableness and toughness, forge ahead as Bill Dube Ford’s experienced team fills you in on everything Ranger has to offer prospective owners or lessees like yourself. We firmly believe you will set aside some time at the end to stop by our inviting showroom in Dover NH and get your hands on the adventure-prepped truck. Your off-road excitement for a wide range of situations is taken to the next level via hardiness and unsurpassed torque. 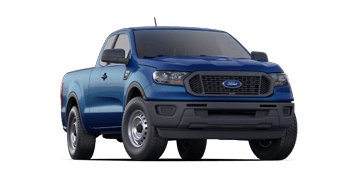 Powered by a robust 2.3-liter (L) EcoBoost engine generating 270 horsepower (hp), the all-new Ford Ranger leads the pack in torque power at 310 pound-foot (lb.-ft.). 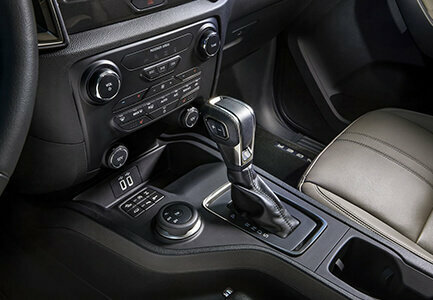 A 10-speed SelectShift automatic transmission uses technology patented by Ford to deliver quick shifting smoothly, and a twin-scroll turbocharger pulls exhaust gas from two cylinders to nearly eliminate lag altogether. Plus, the direct-injection system in the gas motor produces an EPA-estimated 21 miles per gallon (mpg) on city streets and 26 highway mpg, which top its class in fuel efficiency. Carrying large amounts of equipment and belongings for far-off outings across Dover becomes a cinch, as well, with Ranger’s muscle potential. Thanks to division-leading upper limits of payload at 1,860 pounds (lbs.) and towing at 7,500 lbs., you can pack it all in without having to leave anything behind because of space restrictions. Load up everything you may or may not need! When automotive design displays both good looks and indications of the vehicle’s capabilities, the end result is a distinctive appearance that the Ford Ranger brandishes. This midsize pickup’s athletic shape available in several different noticeable shades like Saber, Lighting Blue, or Hot Pepper Red initiates combining form and function. Rounded wheel arches and a wide grille help boost aerodynamic performance, while the twin power dome hood and a windshield cleverly sloped low come together to push air over the rooftop and quiet windy sounds. All of these components and other ones have the dual role of augmenting handling and outer appeal. Moving into the inside, you will see that Ranger’s cabin follows the same concept of blending style with usefulness and also adds in comfort. Firm seats support your posture for comfortable sitting, the controls are easily accessible, and the optional eight-inch touchscreen monitor and dual LCD instrument cluster show vital data. Regarding how much space you prefer for passengers and gear, the SuperCab layout includes front bucket seats, rear bench seat (choice to remove entirely on XL version), and a six-foot (ft.) bed, or a roomier SuperCrew configuration encompasses seating for up to five, four full-size doors, and a five-ft. bed. After you select from the following trim variants for sale or lease at Bill Dube Ford, your upcoming journeys will begin in a cozy setting. 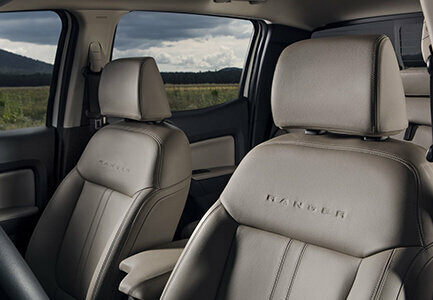 For those who are interested, there are extra ways to continue customizing your purchased or leased Ranger. The large assortment of accessories offered that turn this strong truck into your ideal outdoor expedition ride range from protective bed liners and equipment racks to carriers and bed tents. Completely equipping your revamped pickup for the most thrilling escapades is made possible with the FX4 Off-Road Package. Specialty enhancements entail all-terrain tires utilizing aggressive tread, tuned off-road monotube shocks, undercarriage skid plates, and an exposed steel front bash plate, along with a cluster screen displaying essential figures and high-tech tools that aid in driver command. A Terrain Management System allows you to maintain optimal traction and steering on any surface by switching between the drive modes of Normal, Grass, Gravel/Snow, Mud/Ruts, and Sand. You can also keep your attention on maneuvering across rocky terrain with the Trail Control cruise control system taking over management of throttling, speed, and braking. This add-on package is definitely worth considering for Dover NH drivers desiring to explore beyond the usual pavement routes often. 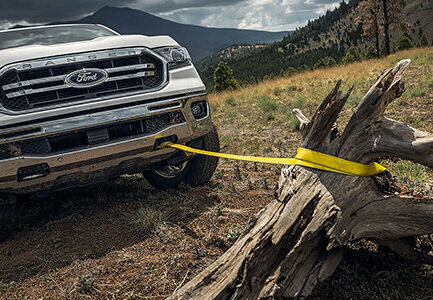 Maintaining connectivity and feeling safe when you and your crew are trekking on roadways or trails is no problem courtesy of various optional advanced tech additions and safety features offered in the brand-new Ford Ranger. In addition to carrying out voice commands and supplying a pair of smart-charging USB ports, SYNC 3 comes with a user-friendly, eight-in. capacitive touchscreen that provides access to your compatible smartphone functions and pinch-to-zoom navigation. Gain use of a 4G LTE Wi-Fi hotspot through FordPass Connect and link up 10 electronic devices total while on the road or a max range of 50 feet away from your pickup. You have the technology needed to run assorted apps on hand, as well. Your vehicle should always serve as an impressive barrier of protection and security. Ford Co-Pilot 360, obtainable on Ranger XL and standard on Ranger XLT or Lariat, provides assistance with driving in congested traffic and avoiding possible danger via a plethora of technological functionalities, including Lane-Keeping System, Blind Spot Information System (BLIS) integrating Cross-Traffic Alert and Trailer Coverage, and Pre-Collision Assist with Automatic Emergency Braking. If you are traveling on unfamiliar terrain, the available electronic-locking rear differential upholds steadiness by increasing traction on those two wheels. Furthermore, off-road ground clearance makes going up hills and inclines much easier. Now that you are in the know on everything the most recent Ford Ranger delivers, especially in terms of off-road versatility and inclusions, give Bill Dube Ford a call at (603) 749-5500 for additional information. A member of our friendly team will accurately answer any of your questions and share insights on each model, accompanying packages, or the Ranger’s comprehensive multi-terrain capabilities and talk about preordering your dream truck. Visit the Bill Dube Ford showroom today in Dover and raise the level of adrenaline on your excursions.